If I was a bigger fan of crime solving dramas, I probably would have given this a higher rating. Eve and Roarke's romance was sweet, but it was only a backstory to the crime solving mystery of who is killing off prostitutes. 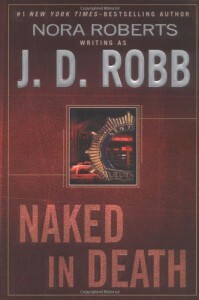 Eve is a dedicated cop with a lot of personal baggage who cleverly works out the clues of the crimes, and Roarke (a suspect) is a handsome bazillionaire with a shady past. The subject matter of the crimes became quite disturbing, including sexual abuse and insest. I cringed at those scenes! I enjoyed that this book is set in the future. I didn't think I'd like that but it really worked. Obviously there are a dozens more books in this series, so the romance part is going to be spread out.